City Guide: Chiang Mai, Thailand — Opium Teahouse. Welcome to Opium Teahouse. We offer an aesthetic approach to travelling, with essays and guides to inspire and arouse your curiosity. As I kneeled down in front of the Buddha of Wat Phan Tao, the only other sound present was the ambience music. Yet, suddenly, a continuous metallic sound started – "plim, plim, plim" – disturbing the atmosphere and turning the heads of the few tourists present. Chiang Mai, the largest city in northern Thailand, offers a change of gears from the bustling southern capital. The former epicentre of the Lanna Kingdom exudes a calm and laid-back atmosphere, surrounded by luscious foothills with unique waterfalls and bubbling hot springs. Yet, it’s by no means a sleepy country town! With a contemporary art scene, myriad of design cafés hidden in backstreets and scrumptious, cheap restaurants, it is one of those places where you’ll keep postponing your departure. "To Doi Suthep? The best way is to get a Songthaew and split the cost with others" said Victor one morning in reception. Together with his wife Thunaya, Victor manages their adorable guesthouse a stone throw away from the moat that encompasses the Old Town of Chiang Mai. The three-story guesthouse offers three types of private rooms — differing in size and type of acclimatisation — an inner garden with plenty of reading material at hand and a rooftop area to escape the heat of the day. The bookings are made through their website directly, which benefits the homely ambience the guesthouse has; a refreshing option to all the backpacker hostels in the neighbourhood. As hosts, Victor and Thunaya, are some of the most considerate and friendly we've ever encountered. Always ready to help, give advice and book activities for us. "Thai people cook with emotion. I have no tea spoons for you to measure oil, so you'll have to cook with emotion" said Pui, as we were about to fire up the gas stove for the first time that day. A cooking school is one of the most popular activities in Chiang Mai, but it's also one of the most rewarding. Earlier that day, after being picked up from the guest house, we stopped at the local Mae Jo market for an insight into the ingredients, before reaching the farm where we'd been doing the cooking class. With seven categories to cook, it's an intense day. But Pui guided us through the chopping process, teased us about bad curry paste when we slacked with the mortar and taught us how to proper stir fry. Catering to dietary restrictions, vegans and vegetarians swap the fish and oyster sauces for soy and mushroom sauces, and the meat for turmeric infused tofu. Being able to choose a dish of each category also helps to create a menu to your liking. If you only have the chance to do one activity, then chose a cooking class, not only you'll get a wealth of information, but also some very good moments. Roughly translated as Flower garden Temple, Wat Suan Dok lies outside of the Old Town of Chiang Mai. The complex houses the traditional temple sights — chedi and prayer hall — as well as Pun Pun Vegetarian Restaurant and the Buddhist Mahachulalongkornrajavidyalaya University. It’s one of the few temples offering meditation courses and meetings with monks. The recently renovated prayer hall — ubsot — is profusely decorated, with its tall pillars covered in intricate plaster work in gold and red. Its other particularly, is the Royal Cemetery of white washed mausoleums, contrasting with the gold buildings and making it one of our favourite temples in Chiang Mai. With some many temples in Chiang Mai, is sometimes difficult to choose what to see. Apart from What Phra Singh, the other three temples are close together in the eastern part of Old town. Although all temples follow traditional Thai architecture, each temple has its own particularly. Either they house an important Buddha statue — Was Phra Singh — have the main building built out of teak panels — Wat Phan Tao — or were the first temple constructed in Chiang Mai — Wat Chiang Mun. There nothing better than having the tension massaged out of the body after days of temple hopping. Lila Massage, with parlours through out Old Town, offers good and intense massages at reasonable prices. With complimentary tea before and after the session, English speaking masseuses and clean beds. Lila’s social responsibility is also deserved praise, as the parlour offers post-release employment to graduates from the Chiang Mai women’s prison massage training program. Kaew brought the heavy tray full of small plates up to the second floor and kneeled to serve them. She was still in her school uniform but there was no time to change, the restaurant was busy with famished patrons. A stone throw away from Thaphae Gate, Aum is easy to miss. The wooden porch makes it look more like somebody’s house than a restaurant and that’s part of its charm. While serving the vegetarian version of Thai classics — papaya salad, pad thai and different curries — the menu also features celebrated northern dishes, like the scrumptious Khao Soi. The food is so well made, that this became our go-to restaurant in Chiang Mai. The service can be a bit slow during peak times, so quench your thirst with fresh juices and smoothies while you wait. On a residential alley, Green Tiger House is, in fact, a boutique hostel that has a vegetarian/vegan cafe. The spacious lounge, whitewashed concrete floors and benches and wooden tables contrast with the colourful fabrics and pillows. The menu offers the classic Thai and some Western options — vegan options marked — and although it can be considered pricier than normal, the portions are generous. After lunch, with good internet service and a relaxed ambience, we ended up staying and getting some work done. Sharing the grounds of Wat Suan Dok, Pun Pun is a great option when exploring Chiang Mai beyond the Old Town. Offering Thai dishes at reasonable prices, the place attracts the temple's meditation students, expats and tourists alike. Pun Pun calls itself as a "slow vegetarian food restaurant" and during the busiest hours, they do take their time. Go early, around noon, or after 2 pm. On the occasion of Pun Pun being closed, this bare bones local joint is a good alternative. Located just outside of the Wat that gives the restaurant its name, the difference between Suan Dok and a food stall is that it has a roof. Popular with students from the nearby universities, the eatery offers a good and diverse range of Thai vegan dishes at low prices. On a street behind Wat Suan Dok, The Barn is the brainchild of a few CMU students. The bright glass building, with modernist details, feels out of place in the typically Thai neighbourhood, but that was the goal. Full of quirky details — crochet placemats, small porcelain knick-knacks and hand made saucers and coasters — it’s an enjoyable space for a cup of coffee and getting some work done. No wonder it mainly attracts students and expats. 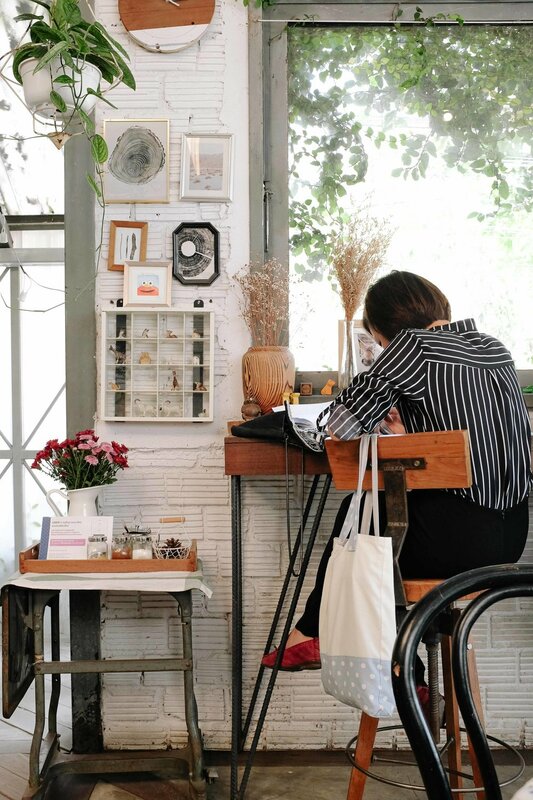 Conveniently located in front of Top Garden Guesthouse, Cat House is a no-brainer when it comes to breakfast, lunch or just to get some work done. This vegan-friendly restaurant offers much Thai cuisine with a twist. Inspired by the cuisine of the world, cooking is done with what’s available, the fresh and seasonal ingredients. The social aspect of Cat House is also a strong selling point; all the staff comes from Myanmar and the owner, Jacky, believes that mentoring them will provide them with the tools to accomplish their dreams. Near Suan Dok Gate, on a sleepy back street, Bird’s Nest serves vegan-friendly organic food and offers a space to escape the afternoon heat. The two story spacious townhouse feels more like the owner’s living room than an eatery, and that’s part of its charm. The menu features all the Thai classics with ingredients sources from the local farms. From London, you can fly to Chiang Mai through in Bangkok. Or, fly to Thailand's capital, explore the city for a couple of days and then take a night train north, to Chiang Mai. We found our flights through Skyscanner, flying directly to Bangkok with EVA Airways.